Been diving in Kenya? Please Vote! Kenya is a country of beautiful contrasts, from the highest highs of Mount Kenya (second only to Kilimanjaro in Tanzania) to the lowest lows of the Great Rift Valley and everything in between. This East African gem is home to incredible wildlife roaming the savannahs as well as diverse and exhilarating marine life in the depths of the Indian Ocean on Kenya’s south eastern coast. Many visitors combine their diving vacation with a visit to the world-famous Maasai Mara reserve, well-known as the best spot to see the impressive wildebeest migrations that occur in this region each year. Kenya boasts 33 protected wildlife parks and reserves, five of which are Marine National Parks. The coral reefs contained in these Marine Reserves are phenomenal and really need to be seen in order to be believed. Not only is the marine biodiversity world-class, but this area of the Indian Ocean also offers regular sightings of dolphins, manta rays, whale sharks, reef sharks and sea turtles. 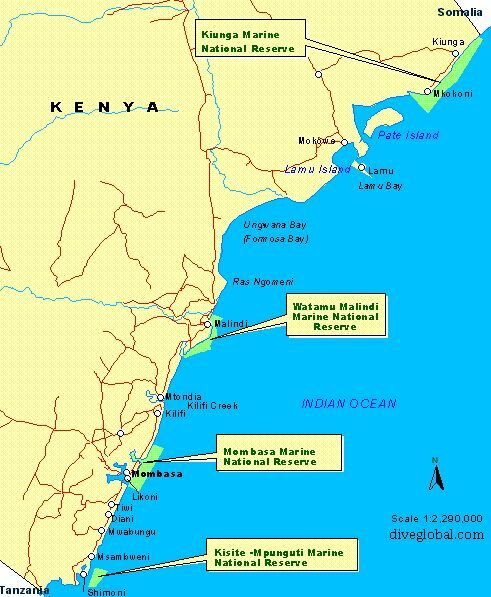 The most commonly dived areas are contained within these Marine National Parks which are in the areas of Malindi, Kisite, Watamu, Mombasa and Kiunga. As if it’s not enough to have a multitude of magnificent reef dives to choose from, Kenya also boasts cave and wreck dives that are well worth a visit and some of these can be found in the area known as Kilifi. Macro life is also in abundance, with rare crustaceans, seahorses and leaf scorpion fish waiting to be discovered and photographed by avid underwater photographers. Kenya has a multitude of brilliant dive sites, all of which can offer something for every type of diver. For those new to diving, Kenya offers some introductory dives that are sure to fill you with enthusiasm for your new sport. The colourful coral gardens filled with hard and soft corals and over 20 million tropical reef fish in the Indian Ocean will even leave advanced divers eager to experience more of what this east African paradise has to offer. For underwater photographers, Kenya boasts rare and interesting macro life, and for those looking to spot the big ones, whale sharks, reef sharks, manta rays and sea turtles are all commonly spotted off the coast of Kenya, with almost guaranteed sightings in certain areas. Below are the details of a few key dive sites you should add to your ‘Diving in Kenya’ bucket list. The Vuma Caverns are a magnificent system of shallow caves, cliffs, canyons and blow holes that can be explored by advanced divers. The site is also famous for sightings of large pelagic fish and regular sightings of whale sharks during their migration. Dolphins, turtles and reef sharks are also in abundance, whilst smaller life such as nudibranchs can be found if you look hard enough. Divers often end the dive by entering the cavern’s chimney, which brings them back to the top end of the reef. The caverns are located near Kilifi Creek, just outside of Watamu which is home to a number of key nesting spots for sea turtles, particularly the green turtle species. Another dive site for advanced divers, this deep dive is famed for both large and small marine life. Critters such as flatworms and colourful nudibranchs can be spotted by those taking the time to look, whilst spotted eagle rays, manta rays, sharks and giant groupers are difficult to miss. Pinnacles can be found within the Mombasa Marine Reserve and as such offers pristine underwater conditions to be enjoyed. The MV Dania is one of Kenya’s best wreck dives and stands upright at depths of between 12 and 32 metres, making this a suitable wreck dive for all levels of diver. The cargo ship was originally built in Norway in the mid-60s and was used to transport livestock, although after being purposefully sunk onto the sandy seabed in 2002 the MV Dania is now home to a different array of life – marine life in every shape and size imaginable. From the minute sponges and blennies to the large groupers, barracuda and moray eels, the vessel is literally covered in marine life. If wreck dives are what you’re after, Kenya offers many more than just one site. Kilifi Creek has two wrecks surrounded by cars and trailers, most likely originating from the sunken ferry and freighter that lie at the depths of this creek. The coast also offers wreck dives in the form of the Lighter, the H.M.S. Hildasay, Mida Wreck, the Globe Star and the MFV Funguo which sank in February 2002 outside of Kilindini Harbour. This popular dive site boasts a number of exciting features including magnificent coral gardens, steep walls and drop offs and a swim-through archway entirely covered in coral. Divers are likely to see reef sharks, turtles, rays and reef fish in their hundreds. For the majority of visitors coming to Kenya for the above-ground wildlife, Nairobi is the easiest point of entry. Many divers however choose to fly into the country’s second largest airport, Moi International, which is 9 k west of Mombasa. From here, divers can drive or fly internally to access the other destinations. Although technically it is possible to dive in Kenya at any time of the year, many consider the best diving months to begin late October and run through February or March. During this time visibility is at its peak of 30 meters and water temperatures are on the higher end of the scale at 28°C. These months are also well-renowned for being whale shark season in Kenya, with almost guaranteed sightings of these large, majestic and harmless beasts. There are two rainy seasons in Kenya, in April and May and October and November, although diving visibility is most likely to be reduced in July and August as a result of windy, rough conditions and strong currents. Some dive operators even close their doors from May to August, so it’s best to check before you plan your trip. Following the seasons of southern hemisphere countries, Kenya’s winter is from June to September, but even then divers need only wear a 3 mm wetsuit for the tropical waters. With air temperatures between 25-32°C, a tropical climate with magnificent beaches and friendly dive operators ready to be of service, Kenya’s coastline is a definitely a must-visit for scuba diving enthusiasts. Kenya’s magnificent coastline is well serviced by a number of dive centers and resorts, many of which have been in operation for decades and are sure to provide great service and friendly, knowledgeable dive guides. Accommodation ranges from large, 5-star resorts and hotels to smaller, more exclusive options. It is also entirely possible to be introduced to diving or advance your qualifications at one of these dive centers as courses are offered for all levels. Feeling inspired and raring to go? Check out our Kenya travel guide and start planning your next diving trip! Amazing reef at Kisiti Atoll in the Shimoni National Marine Park. A must for any serious diver. Huge amount of marine life at the entrance of the cave. Amazing dive site when conditions are perfect. Strong current brings large pelagics. Spectacular reef with a concentration of pelagics, reef fishes and colorful corals. Scenic unspoilt reef with stunning blue soft coral. Large population of pelagic game fish. Kilifi offers a relaxing base and some interesting diving. Huge moray eels and large schools of fishes. Diving from Lamu is best from November to March. A favourite snorkeling and diving destination. Part of the Mpunguti National Marine. Nice dive sites South of Mombassa. The Watamu Marine Reserve has some of Kenya’s best diving. The coast North of Mombasa has several excellent dive sites.